I have long believed that if one can combine the features of competent design, good materials and excellent workmanship then the resulting work will be something of value. I have tried to combine these elements in this clock which was first built at a “crossroads” in my work as a craftsman. 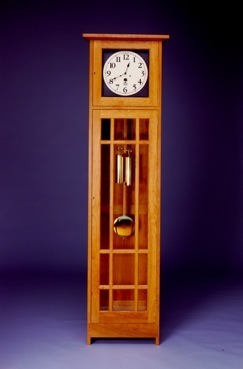 The case construction employs virtually all of the hand skills in the cabintmaker’s repertoire - frame and panel rear door and back; through mortise and tenon, wedged with rosewood or ebony; handcut dovetail joints on the case front above and below the main door; and the most complex and time-consuming part of the clock construction, the cross mullions and muttins of the front door, which require both time and precision to lay out and fit; each joint pinned for proper construction and structural stability (the door will never sag). The lower door alone has 20 separate joints with 40 individual joint members, requiring hand work by mallet and chisel. The movement for this clock is incredible and made here in American by a true craftsman, David Lindow of Lake Ariel, Pennsylvania. It is a traditional bell-strike movement, constructed of solid brass, weight driven in both time and strike, and strikes the hour.